The makers of Veere Di Wedding have dropped a new song titled Laaj Sharam and it is something every girl-to-be-married will relate to. 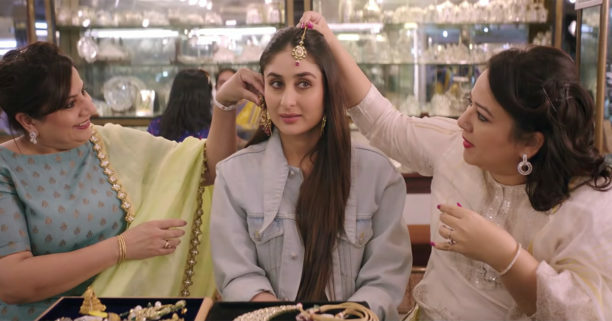 The upbeat number sees Kareena Kapoor Khan dealing with pre-wedding anxieties, whilst knowing there’s no backing out. The song also features Sonam Kapoor, Swara Bhasker and Shikha Talsania who are gearing up for their Veere’s wedding. Laaj Sharam has been sung by Divya Kumar and Jasleen Royal, with rapping by Enbee and music by White Noise. Directed by Shashanka Ghosh, Veere Di Wedding is a high spirited and upbeat coming of age story revolving around the lives of four childhood friends and their trials and tribulations in modern day world, regarding family acceptance, marriage and societal perceptions. Veere Di Wedding releases in cinemas on 1stJune 2018. 15 queries in 0.333 seconds.